There’s no shortage of zombie-related media from which to draw a comparison, but as the story in Mexico develops this season on Fear The Walking Dead, I find myself thinking back to Roland Emmerich’s The Day After Tomorrow. There’s a scene that depicts a mad rush to the U.S.-Mexico border, which thousands, if not millions, of Americans are trying to cross before the impending Ice Age completely blankets the United States. Many don’t want to wait for the “paperwork” to go through, though, so they just start walking across the river. A field reporter describes what’s happening as “a dramatic reversal of illegal immigration,” as if the only people to ever immigrate to the United States were/are Mexicans (and none of them through the proper channels). 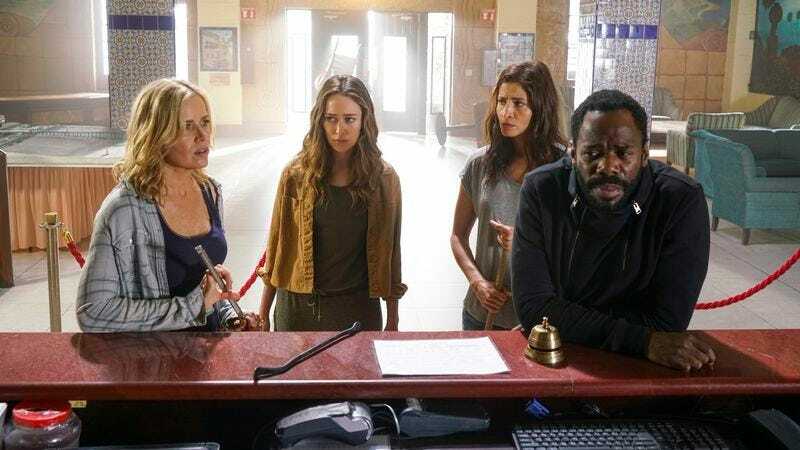 The Angelenos on FTWD have also fled to Mexico in desperation, where they were also met with some resistance when attempting to cross, i.e., the Mexican border patrol that opened fire on the Abigail. The show even shares the film’s attempts at superficial political commentary in those scenes, which is why it’s obvious that this move into Mexico is intended to provide more than shelter for Madison et al. Ahead of the midseason premiere, showrunner Dave Erickson talked about his desire to tell a “border story” within this apocalyptic setting. So last week, Nick made that perilous trip through the desert (he even headed north), where he encountered La Maña, a purportedly real gang of smugglers. Nick’s still caught between two worlds in “Los Muertos,” in the kind of transient state the writers seem content—maybe compelled—to leave him in. But even though the character was able to carry “Grotesque,” resting the themes of the second half of the season on his shoulders is a huge gamble, and one that’s not likely to pay off. 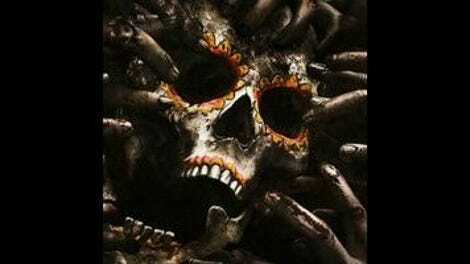 This new Mexican setting is an(other) opportunity for FTWD to set itself apart from Robert Kirkman’s flagship series. The deserts and mountainous regions of Baja provide a nice change of pace from the claustrophobic woods of Atlanta. But Erickson and the other writers are more interested in mining Mexican culture—specifically, its Day Of The Dead traditions—to craft a very different “zombie story.” If TWD original recipe has seasoned warriors who are increasingly inured to all the death and destruction, how about telling a story about people who have never really feared death? This week, the show doubles down on that interpretation/distortion of Day Of The Dead, as Nick encounters yet another death cult. The episode basically opens with a human sacrifice, one that everyone in the Mexican shanty town bears witness to, even the dying man’s young daughter. They chant about the cycle of life, which is really the same as death here. Ever the (more reasonable) outsider, Nick voices his questions and objections to this practice to his rescuers, Alejandro and Luciana. It’s not just that his Spanish has gotten a lot better—although it has, rather unaccountably—but they speak fluent English. Luciana reveals that tidbit when she instructs him on how to behave in his new home, and when she slaps on her walker-camo then orders him to do the same. Nick’s bilingualism isn’t the real issue, of course—“Los Muertos” biggest problem is that the new religion was built on a shaky foundation, because all of the characters fear the walkers. They might not be appalled or bent on destroying them before they’ve had a chance to become chum, but both Celia and Alejandro’s groups keep them contained rather than let them walk the grounds. Because the walkers might not be evil, but they’re still a danger. If, in Alejandro’s words, death isn’t to be feared or pursued, then it’s a horrible idea to let them wander around a wine cellar or crowd a chainlink fence. The fact that this “wall,” as Alejandro calls it, is made up of their decaying loved ones supposedly offers some kind of comfort to the townspeople—they believe they are being protected by the dead. There are certainly many threats out there, especially now that Nick’s angered the supermarket cartel led by Marco. And yet, Luciana mutilates someone’s “loved one” when she needs to camouflage herself for the trip to East Tijuana with zero guilt. When you consider that the thirtysomething guy from the opening was deemed too sick to continue to contribute while an old man who can’t even walk receives a placebo—and “hope”—even the more “practical” aspects of this code are specious. If Mexico’s veneration of the dead is going to be distorted, these new beliefs should at least make some sense. But there are no hard and fast rules, because there really isn’t a foundation for such a belief system. But cult leaders like Alejandro—his followers are the “Children Of The Resurrection”—have never needed logic to garner support. His miraculous recovery from a walker bite is reason enough for these people to follow him, though Alejandro isn’t peddling a cure. But he does tell his followers that they’ve been chosen to “outlast death,” and that they will not be taken. He talks of the “immense migration of death,” in case you forgot where all of the action is taking place. What is interesting about the phrase is that it suggests that Alejandro does believe that the walkers are a temporary blight. That, or he’s preparing for some kind of Jonestown event. Although Nick has a problem with some of the rules, he seemingly can’t resist someone who talks of eluding death, not when he was so recently engaged in the same activity. And he chants in Spanish, because he really is a quick study. With Nick having possibly joined a cult, Madison’s fears about letting him run off are justified, even if she doesn’t know it yet. But she’s still worried about him this week, and has dragged Strand, Alicia, and Ofelia around for days to find him. The foursome eventually finds shelter in an abandoned (except it’s not) hotel, but their tempers are already frayed. Alicia’s resentment rears up again, as she grouses about having had to look after herself because Madison was focused on Nick. With the women outnumbering the men in this group, Alicia’s stepping up, which might be the result of the writers taking heed of fans’ calls for more development of the character. (Or at least, less moody teen-ness.) She and Ofelia figure out someone’s coding system for the undead guests, but that flash of intelligence isn’t enough to keep the latter from despairing about their odds. So it looks like Alicia might be stuck taking care of someone older than her all over again. The new dynamic isn’t lost on Strand, who works hard to charm Madison. Strand’s lost his boat and his lover, and his latest reversal of fortune has revealed just how he’s recovered from the other ones. Victor tells her he’s a “seducer of people,” and there’s a frisson of sexual tension as Madison reacts to his implication that he’d hit on her if they were just two vacationers at a hotel bar. This act isn’t enough to keep her from drinking herself to a near stupor, in which she admits to being from the South (um, how ‘bout that? ), and hints at another chapter in her tragic backstory. She tells Strand that she’s “always tried to save them” but “they keep dying.” Madison suggests Nick might suffer from the same mental illness as his father, then completely loses her composure while talking about “false hope.” Madison’s lost everyone, including potentially someone else in her past, except her daughter. It’s not the most convenient place for a breakdown, but you can’t fault her for being overwrought at this point. The show shouldn’t have to trade one strong female for another, but at least Alicia looks ready for a more active role. I would want to eat Gansitos after the end of the world, too. “La Colonia” is the name of this new haven, because of course it is. Nick’s never been above using the walkers to ensure his own safety, either, which is presumably why he fits right in with the Children Of The Resurrection. I recognized Alejandro Edda, who plays cartel member/shopkeep Marco, from FX’s The Bridge. This guy spends a lot of time at the border.